Nia is confident and powerful. She believes in herself and is a leader. Nia takes pride in doing what is right and doesn’t need external validation. She loves people, and people love her, but if nobody likes her, she likes herself. She is not always right and isn’t afraid to be wrong. She doesn’t need to be perfect in order to be proud of herself. Welcome to Powerful Nia. My prayer is that this collection of works will empower, strengthen and remind us that we are more valuable than we can ever imagine. In My Body Is My Temple, Nia takes care of her body and her emotional well-being. She is a good friend and hopes to find love one day, but knows that true love transcends superficial things and starts from within. The next Nia book, That’s My Business, takes us through a conversation with Nia and her little siblings where she teaches them how to keep themselves safe from bullies and sexual predators. Yes Please, No Thank You shows Nia taking her friends through politeness and etiquette training. Hold the door for the person behind you, wait until everyone gets their food before attacking your place, and greet people while walking. We are all humans sharing this earth. Let’s behave as such. 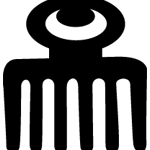 The Logo for Powerful Nia is an Adinkra Symbol called Duafe, or “wooden comb”. It is a symbol of beauty and other desirable feminine qualities like goodness, love and care. It was chosen also because it looked like it would be big enough to get through Nia’s awesome hair! Click here for more about the philosophy behind Powerful Nia. Enter your email address below to be notified when Powerful Nia books are released.